Here’s another NumisNews video. For those who don’t know what NumisNews is, it’s a new format that I recently introduced. I pick an interesting subject that’s in a major numismatic publication and then make a video discussing and highlighting the key points. Today’s NumisNews focuses on the 1894 Indian Head Cent Sleeper. Later date Indian Head Cents rarely are considered hard to find, and although 1894 is not hard to find, per se, it is indeed a lower mintage year worthy of note. At only a mintage of a little over 16 million, there were considerably less one cent pieces minted. The year prior, 1893, there were almost 50 million coins made. One explanation for such a short supply was the Panic of 1893. In that year, the Philadelphia and Reading Railroad and the National Cordage Company, two companies that stimulated growth of the economy, both went out of business. The stock market was severely damaged by this and so was the rest of the American economy. An estimated 15,000 business were shuttered during the Panic. Homelessness and unemployment shot up drastically. It was not a good time for the United States economy. With all the hard times happening, it’s not hard to imagine why the date had a lower mintage. Another reason why 1894 is now being considered a sleeper is the fact that collectors did not save many of this date. Either they saved their hard-earned money for more well-known rare examples or they simply didn’t have enough money to spend on nice examples. This coin is what collectors call a sleeper, or a coin that has a chance of going up in value in the future, in any condition. This is mainly due to mintage reasons, just like this one. Sleepers are not the key dates of a certain series, but, over time, sleeper dates could become the second tier of the series. Whatever your budget is, both stocking up on lower grade examples and breaking the bank on Red Uncirculated pieces could be smart investments for the future. Hello, welcome to Numismatics with Kenny. My name is Kenny Sammut and I am a young numismatist and a volunteer District Representative as well as a Life Member of the American Numismatic Association. 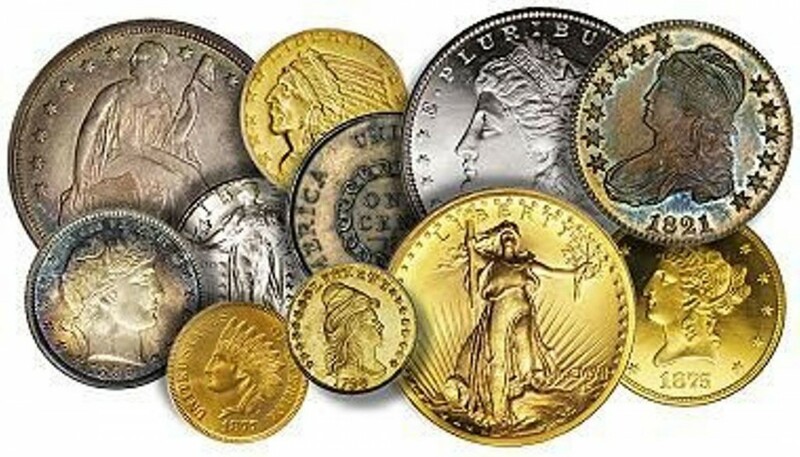 The American Numismatic Association or ANA for short is a nonprofit organization dedicated to educating and encouraging people to study and collect coins, paper money and related items. I created this video for all collectors including children from 5 to 17 as well as seasoned numismatists to consider joining the ANA. There are a number of excellent benefits you will enjoy as a member and the cost to join is very reasonable. One of the best benefits of all is a subscription to the monthly ANA’s membership magazine – The Numismatist. You have the option of purchasing a Gold, Platinum, or Life Membership. The platinum membership includes the printed version of The Numismatist which will be mailed to you each month or the Gold membership which includes the electronic version of The Numismatist which can be read online. Choose the best membership choice for you or your child. Discounts are offered to young collectors. • Go to the bank and purchase rolls and then search them for neat finds. • Most of all, get involved in the ANA and become a member – Being a member has been an important reason why my enjoyment and passion for the hobby has continued to grow. Thank you for watching and I hope you join the ANA. Again, please find the membership link below. Print and fill out the membership form and send it directly to the ANA. 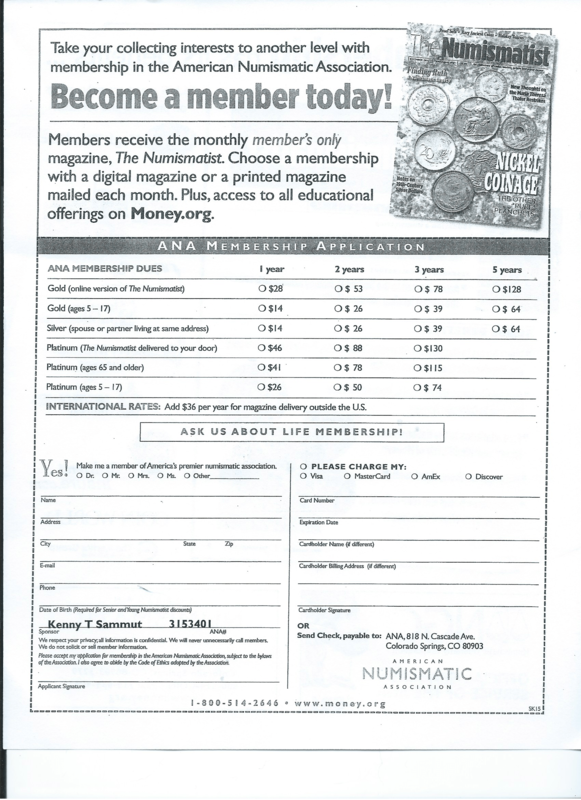 If you would like more information about becoming a life member, please email me at numismatistkenny@gmail.com. Here is my Money Talks presentation about World Coins Minted in the United States. Hope you enjoy! I also served as a page for the entire week on the bourse floor. If you’ve never been to the ANA’s World’s Fair of Money, I highly recommend that you add it to your bucket list. This video is an overview of Early U.S. silver coins and the John Reich Collectors Society (JRCS). The JRCS is a group of collectors who study the U.S. gold and silver coins minted prior to the Liberty Seated series. We hold our annual meeting at the ANA World’s Fair of Money and also meet at the winter FUN show in Florida. All meetings include an educational presentation. Many JRCS members collect early U.S. silver coins by die marriage. These coins were made using an obverse and a reverse die. A die marriage is the unique combination of these 2 dies. The dies were handmade, so each was slightly different. So even though each series has the same basic design, each die marriage is distinctive. Our members include beginning collectors as well as recognized experts in this field who are happy to share their knowledge about the coins we love. In this video, a few of our members discuss each of the 5 denominations of early U.S. silver coinage: half dimes, dimes, quarters, half dollars, and dollars. If you would like to learn more about the John Reich Collectors Society, please visit our website at http://www.jrcs.org. You can download a membership application directly from the website. Dues are $25 a year and in return, you will receive 3 issues of the John Reich Journal (JRJ), the official club publication. The Journal contains articles detailing interesting collecting stories, research papers, and censuses, to name a few. Back issues of the JRJ can be found on the Newman Numismatic Portal at www.nnp.wustl.edu. The JRCS also supports an official weekly e-newsletter called the JR Newsletter and can be found at www.jr-newsletter.blogspot.com. It’s free to anyone and contains information on upcoming events and new discoveries. It also allows members to keep in touch on a more regular and informal basis. Please consider signing up for the JR Newsletter at jrnewsletter(at)gmail.com. Hello everybody and welcome back to Numismatics with Kenny. Sorry for the long delay with no videos. Since I’ve been taking tests and finals and exams, I haven’t had any time to even think about this YouTube channel. But now that summer has rolled around, I’ll finally be able to produce and upload some new numismatic content! Today, I want to roll out one of my new ideas for this channel, called NumisNews. This is where I find an interesting news article about numismatics and I share information about that subject. The first one is about the Solomon Islands $40 Bank Note that was just released (as of July 2018). As most of you don’t know, the Solomon Islands are celebrating their 40th anniversary of gaining independence from Great Britain. To mark this special anniversary, a limited edition $40 bank note is being released in the Solomon Islands. Limited to 100,000 notes, this polymer is fifth in a series of multi-island and multilingual notes, including a $10, $20, $50 and $100 notes. De La Rue, a British banknote printer, is producing the notes, just like they do for so many more countries. Adorned, with braille for the blind and even a turtle that glows under ultraviolet light, the Solomon Islands $40 banknote is meant to be a collector’s item. But the Central Bank Governor Denton Rarawa has stated that it will be used in commerce for the purchase of everyday goods.